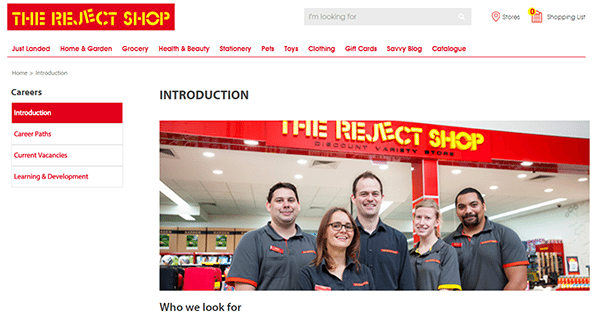 The Reject Shop job application is available on the company’s website. Read the guide posted below to learn more about the company’s online hiring process (how to search for jobs, create an account, and submit an application). Numerous types of positions can be searched/applied for across multiple locations. About the Company: The Reject Shop is an Australian chain of discount stores based out of Kensington, Victoria. The company was formed in 1981 and operates more than 300 locations throughout Australia. The Reject Shop employs over 5,000 people. Step 1 – Click this link to open the company’s careers page. Step 2 – Scroll down the page to learn more about the company. Click the “Career Paths” link on the left side of the page to learn more about the different types of positions that you can apply for. Step 3 – Press the “Current Vacancies” link to go to the main listing of current job openings. Step 5 – Press the button as shown in the below image to go to the next step of the process.